Just dropping in, in case any of my readers are still checking on this space. And it’s available for pre-order! Details can be had on my main blog. I’m speaking at Press Publish in Portland, Oregon March 28, 2015. This is a WordPress conference–and will focus on blogging–and my talk will focus on how comments on Jadepark saved my life. In more ways than one. Would love to see you there, if you’re in Portland. Attendance does require registration, but you can use the coupon code CHRISTINE40 to get 40% off. And I’m delighted to point you to my speaker spotlight over at Press Publish. It’s been amazing coming out of anonymity. And I’d love to see you in Portland. Seven years ago on December 31, 2006, I had a stroke. And I published an essay about the experience recently. I’m glad I chronicled the experience on this blog, because the information was helpful to me as I wrote the essay; so much is still inaccessible to me, even years later. Mostly, I’m grateful to all the friendships I forged while blogging my stroke. And I did literally blog my stroke, from the first moments onward. I don’t blog here anymore, but the stroke archives are here for you and for me. Thank you for reading. Day 270: Why won’t Autumn arrive? I’ve survived a summer in NYC (well, most of the summer, since I spend August in San Francisco). And now I anxiously await Autumn. Or more specifically, Autumnal weather. New Yorkers are donning sweaters and tights and scarves and jackets and boots. I don’t understand; it’s over 75F degrees and muggy these days. In the Springtime, when we had this very same weather, people were in shorts and Spring dresses. The only conclusion to which I can arrive is that New Yorkers dress according to the time of year, regardless of weather. (This explains why my New Yorker parents, when we later moved to Los Angeles, would make me don tights and sweater dresses in September, when temperatures would typically soar into the 90s Fahrenheit). Meanwhile, I’ve obtained a Kitchenaid mixer for the kitchen. I’m getting ready for Fall–by dreaming of baked goods comprised of pumpkin and spice. But there’s no way I’m turning on the oven until the temperatures come down and it’s really truly Autumn. In terms of an update from my last update, in mid February, we did indeed move into our new apartment. We furnished it, little by little. Fell further in love with the East Village. Took lots of nighttime walks up and down 2nd Ave on sultry summer nights. Saw several more rats. Ran into, and then walked several street fairs (those zeppole vendors are everywhere, aren’t they?). Ate ice pops. Battened down the hatches for Irene. Got acquainted with the 6, N, and R lines. Braved the steamy subways. Experienced baffling amounts of summer precipitation. Saw incredible sunsets. Well, more than what I listed above, happened. I am in love with this city. Day 46: a warm day, & a signed lease! For the last 2-3 weeks, we went apartment hunting, with broker in tow (or rather, the broker took us in tow). AWESOME broker. We found quite a few places, and ended up bidding on nearly all of them–and finally ended up in our top choice in the East Village…but not without learning that THE NYC APARTMENT RENTAL MARKET IS A WILY MONSTER. We had to provide a kazillion financial information items (credit, bank accounts, bank account statements, etc, etc. )–more than what we’ve needed to provide during the home purchase process in California. On top of that, we’ve had to provide our dogs’ veterinary records (thank goodness I brought a copy of them with their most recent vaccination reports/checkup report to NYC). Jeebus! I’ve revealed less during a gynecological exam. At this point, I’ve called the movers, we’ve procured our basic furniture items…and now we wait for the move-in date. I’m tensed for last minute drama, while simultaneously dreading it, while also excited about our new abode. We’ve also been spending more time in the East Village, in anticipation of our move. Funny how Tribeca/West SoHo neighborhood blogs celebrate their neighborhoods…while the East Village blogs mourn their changing neighborhood (case in point: EV Grieve). Can we just say it? 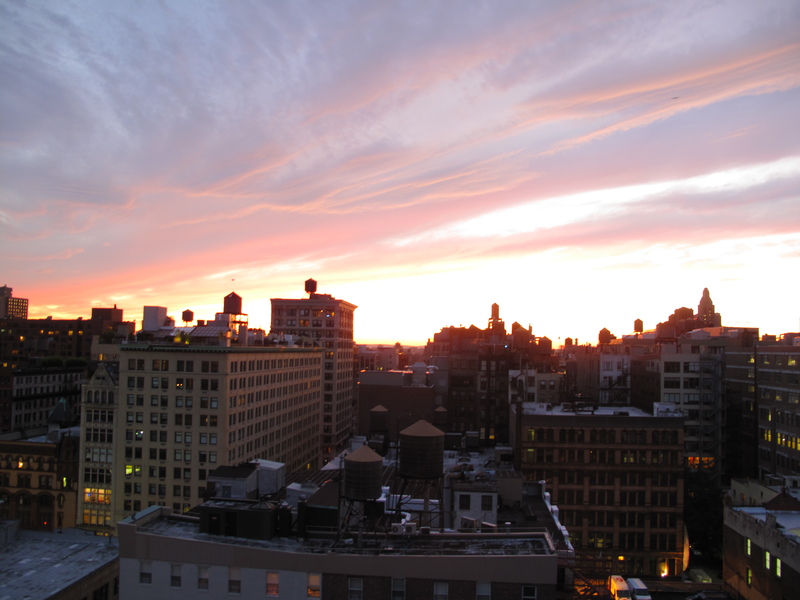 We looooove the East Village. I love that I can get a meal for $2.50 (a small falafel sando at Mamoun’s thank you very much). I love that there are myriad places open 24 hours (Veselka). It feels good to have signed a lease. We are not going to be homeless. Also–my eyes, after a month here, are spotting details within NYC. 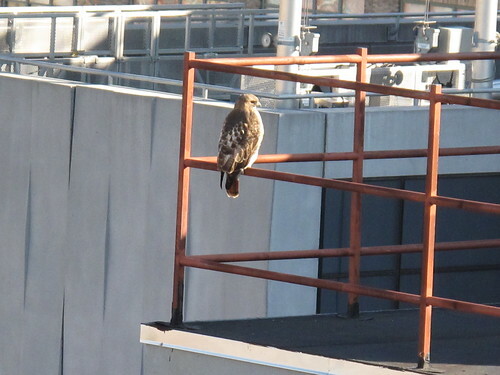 Instead of gazing at high rises, I can now see a hawk sitting on a neighboring rooftop. The fella up above? I spotted him while on the phone. I ran to sneak a few shots of him. I needn’t have run; he sat there for a good half hour, before he ruffled his feathers, spread his wings, and lackadaisically took flight, down into the caverns of downtown. There is an interview series called When My Mom Was My Age. I’ve wanted to participate, if only as an excuse to ask my mom some questions about her life at my age (37). My hopes were that I would learn something from her, and gain some insight into my mother. I was going to post the interview up at my irl eponymous blog…but after hearing my mother’s answers, I balked. I didn’t even know if I wanted the answers up at all, because her answers felt so dark and filled with regret. It was, in sum, depressing to me to hear that my mother wasn’t happy at all at the age of 37, and was living, psychologically, day to day. She regrets the many decisions made then–and coincidentally, or perhaps not so coincidentally, one of my life mottoes is, “Do not have regrets.” Listening to her, as I sit in the housekeeping years of middle age, I felt a deeper resolve to keep my life a happy adventure. I also noticed her child-centric answers, as I navigate my 30s unable to have a child and without child. Was it her children who held her back? Or her children who saved her? At the current age of 67, she still feels trapped by the decisions she made (or rather, didn’t make) in her middle age. Which makes me feel awful. And yet enlightened. And awful. And yet enlightened. Who wants their own mother to feel their life is a cautionary tale? And yet–I learned, even as my heart broke. And so, I’m posting the interview here on WUP. Otherwise, there are no pictures of me and my mother, posted here on this anonymous blog. The interview is pretty much unadorned. She doesn’t go into details at points, and I know the dark context. It’s stark. Kind of like how I felt as I listened to her words, her voice creased and weary with time. I lived in Arcadia, California. 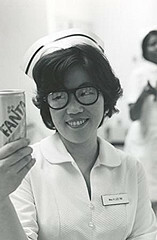 I worked at Garfield Hospital. In the morning I woke up, I went to the hospital to go to work. I worked fulltime that time I was fulltime, working in the ICU, then coming home. Grandma was sitting on the sofa, and I had to cook, spend some time with you and your brother. Make dinner. Sleep. Then go to work again. That time–ahhh, it was a tough time. Everyday, people picked on me, and give me a hard time. Grandma everyday was tough on me. Everything was a headache. I only liked you and R. Everybody a work asked why I was smiling all the time; every time I don’t feel good, I just think about my kids, then smile. I was most happy face in the hospital. You two make my face so bright. I was the one, they called me the Happymaker because even though I have a lot of headache at home, my kids made me smile. My future. No. Just my children. Good school, and hoping when they grow up, they become doctors. Actually I wanted you to be a doctor and go to a good college. At that time, I was just thinking about your future, all the time. I didn’t think about my future at the time. Just my 2 kids. If I had to do it again, I would have studied. Even if I fight with Daddy about school, I can study and make my life better at that time. Do you have advice for anyone else at that age? Advice. Just think of yourself for the future. Of course, children are there, but concentrate, do what you can do for your kids. If you’re hungry, don’t make your kids hungry. Do your best. Also, if Mommy goes to school, there are good effects to the children, because they can see Mommy study so hard, working so hard, making a good example for kids. Unexpected addendum to Day 18. I think I have to enter the NYC rental market, something I’ve been lucky to have avoided until now (we’re lucky to be renting from friends right now–we never even had to look for a place to live). I haven’t shopped for a rental apartment in over 12 years, and definitely never in Manhattan. I hope it’s not as terrifying as I think it will be. I know–princess problems, but I think I’m about to cry (because that’s what princesses would do).